The seed packets shown on this page are small size, suitable for a teaspoonful or two of seeds, which is ample for many smaller garden seed types such as marigolds, portculaca, pansies and sweet william. 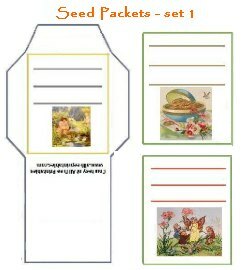 Click on the seed packet designs that you would like to print, and you be will taken directly to the page for those designs. 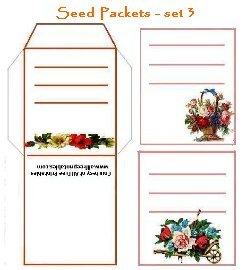 Each design set will print out three seed packets on each page. Although they are have colored images, the backgrounds are white to save on printer ink. 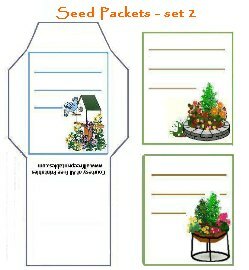 Print out a set of three seed packets. Cut out each seed packet, just outside the colored lines, including the side and top tabs. Fold the side tabs inward toward the center of the packet. Fold the back of the seed packet upwards, over the side tabs, then unfold and apply a little glue to the side tabs. Refold the back and press into the glued side tabs. Let the glue dry, then write any notes on the front of the packet. You could include the name of the seeds and the height of the flowers at full growth. If needed, you can write more information on the back of the seed packet. Fill with garden seeds and glue the top flap down.